Every veteran’s organization in the country has been disseminating information for the past 4 years about the V.A. being under funded (actually more than that, but since BushCo it has gotten substantially worse). Since the megalomaniacal “Mayberry Machiavellis” in the White House and Congress kicked off their little “war of aggression” in Iraq, the V.A. has been overwhelmed with new veterans back from Iraq with myriad physical, mental and emotional problems—over 103,000 so far. However, the BushCo cabal has not seen fit to even remotely come close to the proper funding of the V.A., and the veterans from this latest war of deception in Iraq are now joining with the rest of us from wars gone by in the fight for veterans’ fair and just treatment. Or should I just say treatment—as that is what is lacking across the board. To make matters worse, if that’s possible, the BushCo appointment of the former chairman of the Republican National Committee, Jim Nicholson, as the head of the V.A. pretty much sealed the fate of veterans needing health care at the V.A. Nicholson is nothing more than a BushCo ideologue who is promoting the ideological position of BushCo. In fact Nicholson stated, when he appeared in front of congress that, “health care for our veterans is not being affected by the V.A. shortfall.” How to lie with a straight face—that is what he did, lie with a straight face. 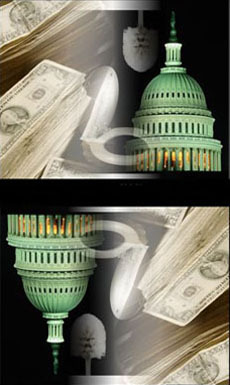 VA funding was shifted from the subcommittee that includes housing and NASA programs to the subcommittee on military quality of life and VA related agencies, which forces the VA to compete for limited funds with such programs as Defense Department health care, military cemeteries and military construction. BushCo administration policies and votes in the House and Senate suggest that the GOP (and the Democratic Party) does not view the care of veterans as "a continuing cost of war. Both parties have over the years been “asleep at the wheel” when it comes to properly funding the V.A. so that veterans that come back from the messes they are sent into. For the next few weeks the House and the Senate, will fight over whether to give emergency funding of the V.A. of $975 million as says the House, or $1.5 billion as says the Senate. When the truth of the matter is that the V.A. needs right at $3.2 billion to do what it is set up to do—care for this nations veterans. The House and the Senate will put on a show of care and concern; they will go home over the congressional recess and tell everyone how much they care and what they are doing to resolve the V.A. shortfall. In the end, the V.A. will still lack the funding it needs to properly take care of the veterans of this nation who continue to pay the “cost of war” for the rest of their lives. There will be many parades and many speeches about the sacrifices of veterans and how the nation must honor veterans; Special days so people can feel good, and for the veteran, the day after the parades and speeches, nothing changes. Year by year more veterans seek help for mind and body at Veterans Administration Health Care facilities only to be turned away in increasing numbers—V.A. has no money, no room at the Inn. But, every year on “Veterans Day” on “Memorial Day” on the “4th of July--Independence Day,” there are parades and speeches extolling the sacrifices of those that went to war—and the day after the speeches, for the veteran, nothing changes. Bodies are still broken; minds are still tormented and haunted by nameless faces in the night. A young man returns form Iraq missing both legs. After discharge from the Army he ends up having to live in his car—where is the “honor our veterans” for this young man? Stu, 25 year old Marine is in an auto accident within 24 hours of his discharge but has to go to a civilian hospital for treatment and surgery. Why? The V.A. told his family he did not qualify for V.A. care. Josh, another 25 year old Marine goes nuts while still in Iraq ; Instead of the Marine Corps trying to treat his multi-symptomatic PTSD they put him in jail for 5 years. How does any of this show honor to those that have given their all? It would be easy to dismiss these three as imaginary people, but they are real and their stories are real. The worst of it is the simple fact these three are not atypical. One generation of veterans after another have been asking this nation to live up to the agreement, the promise, it made to veterans; simply to provide the mental and physical healthcare in an timely manner by qualified medical personnel. To provide disability compensation for those that are unable to work due to their disability; And to stop pitting one group of veterans against another in a fight for decreasing funds in the V.A. If this nation really cared about “honoring” those that have borne the cost of battle it would make the V.A. budget a mandatory budget line item instead of what we have today. Today not only is the amount of money for the V.A. up for grabs from year to year and voted on, but if there will even be a budget for the V.A. In short, properly fund the V.A. and that would be a first step at living up to the promises made to those, by this country, that would experience the inhumanity and brutality that is war. According to Veterans for Justice: “As the cost of the Iraq War blunder continues, costing America's Tax Payers billions, and billions, of dollars every couple of months to set up a puppet government in Iraq, our own government is in danger of following in the path of the Soviet Union and falling due to the massive debt, and out of control spending by the Bush Administration…. Unpatriotic President Bush, and the extremely unpatriotic Republican Party has schemed and set up a Veterans Disability Benefits Commission with the goal of finding ways to get our disability checks. This lack of across the board care and concern past just lip service from congress over the health care needs of this nation’s veterans has got to end! The cost of war does not end for those who went to war when they come “home,” it goes on and on and on and on. Take Action VA Budget Shortfall, Please Contact Your Senators Today! If your email program does not recognize the URL as a link, copy the entire URL and paste it into your Web browser. Funding for programs like veterans’ education and job training, health care, pensions, VA housing and the like are “hurtful” to national security, Pentagon official David Chu said. Chu was defending a new round of cuts during a recent interview with the Wall Street Journal. With nearly 240,000 employees, the VA is larger than all other federal departments except the Pentagon. But even before the "war on terrorism" began, it had to scramble in dealing with the needs of 7.5 million enrolled vets, including a large number of homeless - 33 percent of homeless men in the US are veterans. PRESIDENT Bush gives plenty of lip service to men and women in uniform. Now it’s time for the President to put his money where his mouth is and fully fund veterans’ benefits. An official of the Department of Veterans Affairs admitted last week that it is short $1 billion for the current fiscal year, which ends Sept. 30, but giving short shrift to those who have served their country is nothing new for this administration. WASHINGTON (AP) -- The Bush administration agreed Wednesday to ask Congress for more money to meet veterans' health care expenses after disclosing last week a politically embarrassing $1 billion shortfall in the program. Within BushCo’s war policies one thing in particular has got to be not only looked at, but we must act, and the sooner rather than later as a lot of lives are at stake due to the use by the U.S. of Depleted Uranium. It was approximately three years ago the GAO (General Accounting Office) attempted to do what congress requested: an audit of the DoD/Pentagon. After a solid year, the GAO had to report back to congress that they could not complete the audit as there was no supporting documentation to account for what had happened to a little over $1.4 Trillion, yes Trillion with a capital “T” that was MISSING! "Depleted Uranium Casualties: Care Denied"
More than 85,000 U.S. soldiers who fought in Iraq and Afghanistan have sought medical care from the Department of Veterans Affairs after getting back, that department told Congress Thursday. That is an increase of 52,000 GIs since last summer -- last July the VA said 35,000 vets from Iraq and Afghanistan had sought medical treatment from the department. Jack Dalton is a disabled Vietnam veteran and writer that lives in Portland, Or. He has a blog, Jack’s Straight-Speak and is a columnist for the Project for the Old American Century as well as many other web publications.